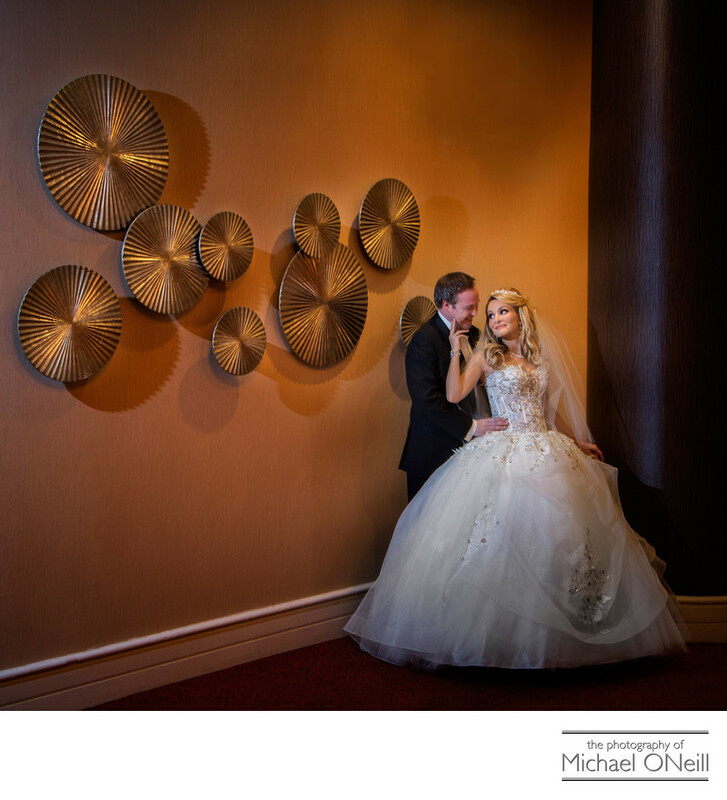 This romantic, intimate wedding portrait was created outside of the main ballroom at The Hyatt Regency Hotel. All of New York’s luxury hotel venues offer incredible backgrounds for dramatic wedding photos. This is a classic photographic composition employing some of the most important fundamentals of a great image. The bride and groom are located in the right one third of the image, not centered (Which makes for a rather static, boring photograph). The couple is also placed in an area of "negative space" between the ornamental wall decorations on the left and the architectural column on the right. Simple considerations like these make for fine wedding photographs. Sure, it’s great to have casual, candid, spontaneous pictures from your wedding day...and a good deal of my efforts at your event will be dedicated to that pursuit. It’s also great to have dynamic, elegant, fashion-inspired images that make you look your absolute best on this most important day of your lives. Be sure your photographer is well-versed in the fundamentals of beautiful lighting, elegant posing and dynamic composition. Anyone can snap a cute, candid picture with their smart phone camera nowadays. To be perfectly honest I’ve seen some great pictures made that way. But when it comes to giving you truly unique and elegant photos to remember your wedding day trust only an experienced, skilled professional wedding photographer.